Growing some of the lovely Jovibarba species such as allionii, hirta, sobolifera and arenaria is easy, as they have only a few requirements. 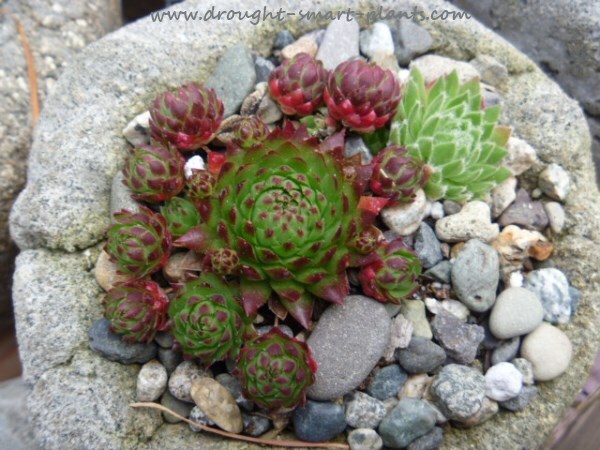 All that these Jovibarba species require, along with their close relations Jovibarba heuffelii and Sempervivum, is a very well drained soil, which can be provided by planting in a raised bed amended with grit to form an open medium. I usually add a small amount of either worm castings or bagged steer manure to provide a slow releasing source of nutrients. They dislike winter wet, or waterlogged soil. They also do exceptionally well in containers, even in cold climates with severe freezing. I’ve had good success with the Jovibarba species in wheelbarrows and shallow satellite dish planters even through harsh winters. 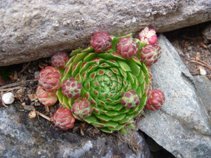 In areas that typically get a lot of freezing and thawing, Jovibarba species might be the only thing that survives this kind of situation; they're even tougher than Sempervivum. Most of these species can be propagated from the rollers, or propagules which form above the rosette and are held only by a thin delicate stolon, which breaks under the weight of the chick. The roller then rolls away to root and form a colony. These rollers can right themselves if they end up upside down over a period of a few days, eventually turning over to put the root side of the chick to the soil surface where they root. 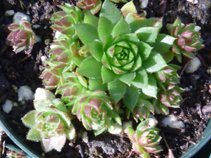 Happily, they are easy to relocate, simply pull off a single rosette or a clump and place them where you want them to grow. 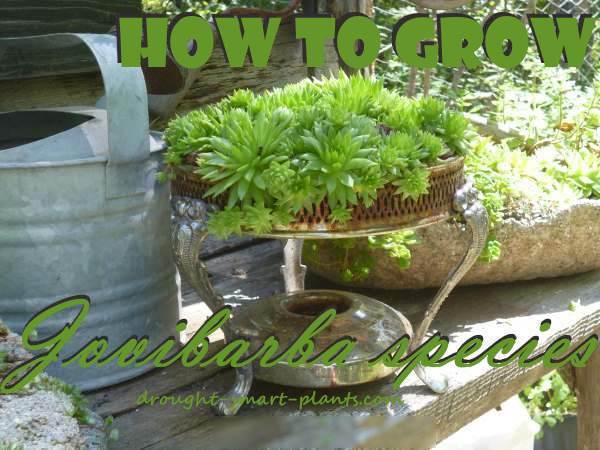 Jovibarba species are also easy to grow from seed collected either from your own plants when they bloom, from a specialty seed house, or alpine plant club. 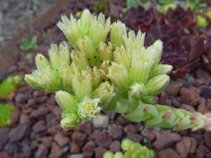 The rosettes are monocarpic, which means they will dry up and die once the flower stalk starts to cone. Over a long time – several weeks – the flower stalk elongates, then pale lemon or white bell shaped flowers open in a progression on the star shaped cluster. Bees and other pollinators visit to get the nectar, transferring the pollen in the process. Wait until the flower heads start to dry and the seed pods form, then cut the bloom stalk off, place in a paper bag and let the seeds fall out of the papery husks. They store quite well over the winter as long as they are completely dry – use the little packages of silica gel crystals in vitamin bottles to make sure all the moisture is out of them. In the spring once the weather warms, you can sow the tiny dust like seeds on the surface of sterilized potting soil in shallow trenches in a flat. The seeds don’t need to be covered, in fact there is evidence that they require light to germinate. A light sprinkling of turkey grit will help to shelter them, and prevent moss or algae from forming. Mist lightly until germination takes place, and gradually move them into a sheltered spot outdoors. 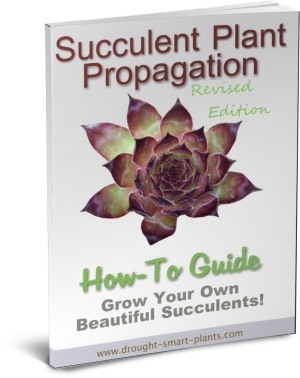 As they get big enough you can prick them out into small 2” pots, or wider spacing in a flat. Over crowding will stunt their growth, so spacing them will ensure they are big enough to withstand the cold of winter. Even in the tiny 2" pots, they will incredibly produce their own rollers! The tricky part is overwintering them either once they are transplanted into 2" pots, or simply left in an open flat to grow on. If they are really tiny, leaving them in a flat is a good option. The following spring, they should be a big enough size to plant into garden beds, containers or succulent crafts such as root planters. You’ll be fascinated by Jovibarba species, these jewels of the garden – I’m predicting that you won’t be able to stop at one! New gardeners sometimes have difficulty with planting their new plants.